Blockchain technology, as revolutionary as it is, is perhaps most revolutionary in exposing the corner of a whole new philosophy of economics that can be formulated as a Network Economics of Abundance. Not just a new economic theory, but a new philosophy of economics is required because the entirety of existing economic theory has been constructed around the assumption of scarcity, and reconfiguring our economic thought around abundance instead as a central parameter requires rethinking economics so profoundly as to be a new philosophical position that is outside the field of economics. Thus, it is timely to articulate a Philosophy of Abundance. 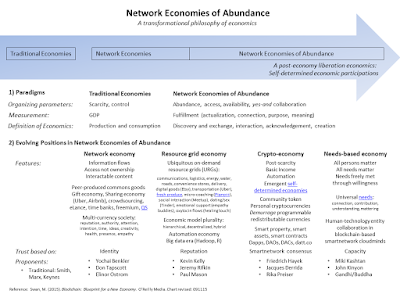 Many different pieces have been emerging in the world that can be assembled into a description and future vision for this Network Economies of Abundance (Figure 1). 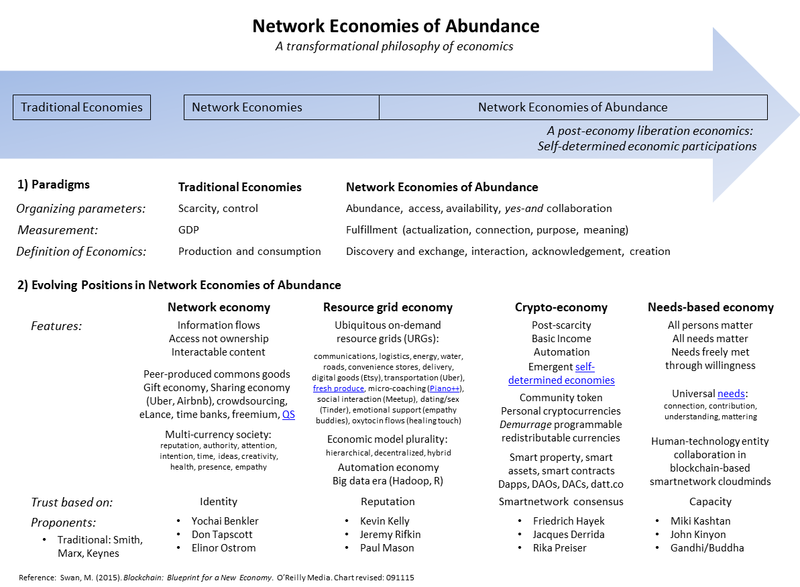 Figure 1: Network Economies of Abundance: A transformational philosophy of economics. Click for a bigger chart. First considering Paradigms, two positions can be articulated. First is Traditional Economies. We are familiar with traditional economic models where the organizing parameters are scarcity, control, hoarding, hierarchies, and relationships of power being held over others. The definition of economics concerns the production and consumption of goods and services, and success is measured by output (GDP). The goods and services that are valorized and measured in the formal economy are produced by monetary-based labor. A second position is Network Economies of Abundance where the organizing parameters are completely reversed. This economics is based on abundance, access, availability, yes-and collaborative willingness, and power shared with others. Network Economies of Abundance are measured in fulfillment; though actualization, connection, purpose, and meaning. In a full, liberation economics, the measurement metrics are self-chosen by individuals and groups. The definition of economics has shifted, away from transactions, even if game theoretic, to interactions. Economics can be seen as a facilitation mechanism rather than a transaction mechanism. Economics becomes a discovery and exchange process, one of interaction, acknowledgement, collaboration, and creation. Network Economy: Already in the current world, distinctly different economic models have arisen and co-exist alongside the traditional model. This has always been true regarding the informal sector, and is now more recognizable. One feature that characterizes network economies is a free flow of information, and engaging and interacting with that information, and more generally active participation. Another feature is that there is a mindset shift to access rather than ownership, or at least an attunement to different ownership models, and the notions of rights, responsibilities and stewardship attached to each. There are peer-produced commons goods like Wikipedia, sharing economy properties like Uber and Airbnb, and there is a multi-currency society where other currencies such as attention and intention are monetized. Societal shared trust stems from individual identity being known by others. Resource Grid Economy: This is what is starting to unfold now, the idea of Ubiquitous on-demand Resource Network Grids, which is fundamental in the mindshift to abundance. More and more resources are becoming fully dynamically available, lurking in the background as a resource blanket, to be called forth on-demand for use at any moment. For example, mind-controlled personalized drones could deliver on-demand items from an intention picked up by personalized QS EEG neuro-hacking rigs or smarthome personalized robots like Jibo, or the Nest. Ubiquitous resource grids are practical, and contribute to the ongoing mentality shift from scarcity to abundance. Time is freed for other higher-level cognitive engagement and enjoyment when resources are always-available on-demand, instead requiring cognitive effort to plan for availability. A simple example is having to know the bus schedule (keeping it loaded in memory) versus walking outside, opening up an app and seeing what bus is next. Societal shared trust is a function of agent reputation. Crypto-Economy: The emerging crypto-economy uses blockchain technology and cryptocurrency tokens like Bitcoin to automate and facilitate human (and human-technology) interaction patterns. Decentralization as a new organizational paradigm extends our capabilities beyond hierarchical organizational models (both practically and values-wise (e.g. ; more autonomy for all agents)) into trustless very-large scale models for coordinating world-scale activity. A million cryptocurrency tokens could bloom as the community token of individual cryptocitizens and groups for coordinating local post-monetary economies like basic income initiatives and demurrage programmable currency redistributions. Cryptographic ledgers could coordinate spot transactions (cryptocurrency) and t+n interactions with smart contracts and autonomous dapp, DAO, DAC, DCO, and datt.co entities and all physical and intangible assets registered as smart property. Societal shared trust is instantiated though smartnetwork consensus, independently non-totalizingly (integrity-preservingly) signed. Needs-based Economy: A final position in the Network Economies of Abundance could be one in which the focal point is needs, where the needs of all entities readily surface and can be met. A needs-based economy focuses on the most important aspects and deeper level of what occurs in economic transactions. Each entity (person, group, community, country, technology entity) has needs. Some of the most important needs for humans tend to include acknowledgement, connection, contribution, meaning, and action in the world. Economics is a strategy for getting these and other needs met. Smartnetwork code entity DAOs/DACs could unobtrusively orchestrate patterns of interaction among biocryptocitizen agents to maximize needs-meeting, including by registering needs as smart assets to which token is posted to indicate degree of met-ness (basic income smart needs). Another example could be secure user-permissioned cloudmind collaborations with other human and technology entities for the purpose of problem-solving and creative expression. Societal shared trust is a priori, based on agent capacity, in digital society smartnetworks of the future. Reference: Swan, M. (2015). Blockchain: Blueprint for a New Economy. O’Reilly Media.